“Are you going to Scarborough Faire? Remember me to one who lived there. My favorite thing to do in summer is go to the Renaissance Faire! As a matter of fact, the Ren Faire is sort of my idea of heaven on earth. Luckily, we have one every year in Bristol, Wisconsin, which is only about a two hour drive from Chicago, so I get to go quite often. A lot of people have never had the pleasure of attending one of these galas. If you have never been, I suggest you find one, get your groove on and go! The Ren Faire has something for everyone and is a guaranteed good time for all. In addition to the normal Renaissance festivities, each week the Bristol Faire features a different theme. These include cool things like pirates & swashbucklers, monsters & magic, heroes & villains, comic-con and steam punk! What’s not to like? It usually starts out with a parade. These gypsy girls stole the show with their colorful costumes and bodhráns. But what exactly is the Renaissance, and why have a faire about it? The word “renaissance” means “rebirth”. It generally refers to a period in European history spanning from the 14th to 17th centuries — although some folk claim that the 10th and 12th centuries qualify as well. The Renaissance was a part of the Middle Ages that bridged culture into the Age of Enlightenment. Most historians consider it the beginning of the Early Modern Era. It was a great time of innovation, open-mindedness and scientific discoveries. The invention of the printing press led to a flourishing of literature and the arts. This was Shakespeare’s time, and although the theater was still considered bawdy, it gained wide acceptance and was favored by Queen Elizabeth. The Renaissance era is closely associated with the Elizabethan era. As a matter of fact, Queen Bess herself is often seen riding though the streets of Bristol! With a few courtiers on hand. And my personal favorite, the harp. 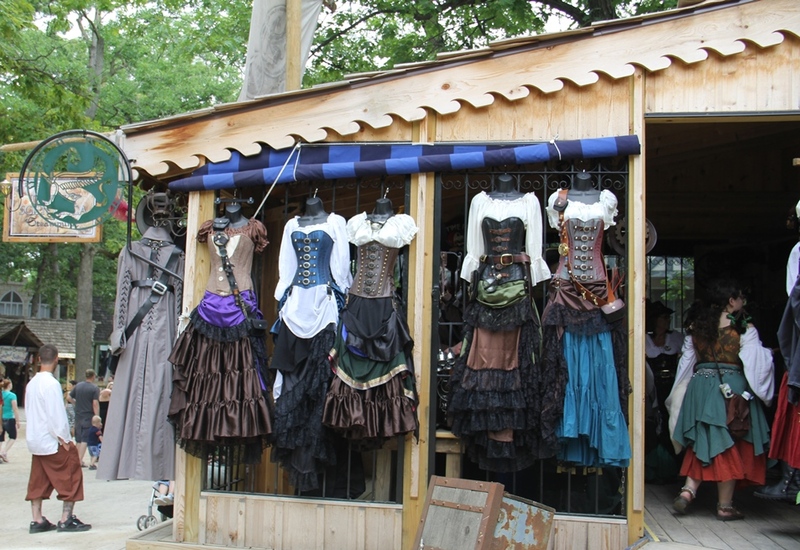 The Ren Faire is a shopaholic’s dream, with all kinds of merchants eager to sell their wares. You can purchase jewelry, clothing, nick-nacks, books, and all the necessities like drinking horns, blown glass, tarot cards and tapestries. It is a great time to explore your inner Elizabethan persona, or add a wench outfit to the wardrobe. Gandalf the Wizard takes time away from ring quests and journeys into Mordor to preside over festivities. And then there is the joust! 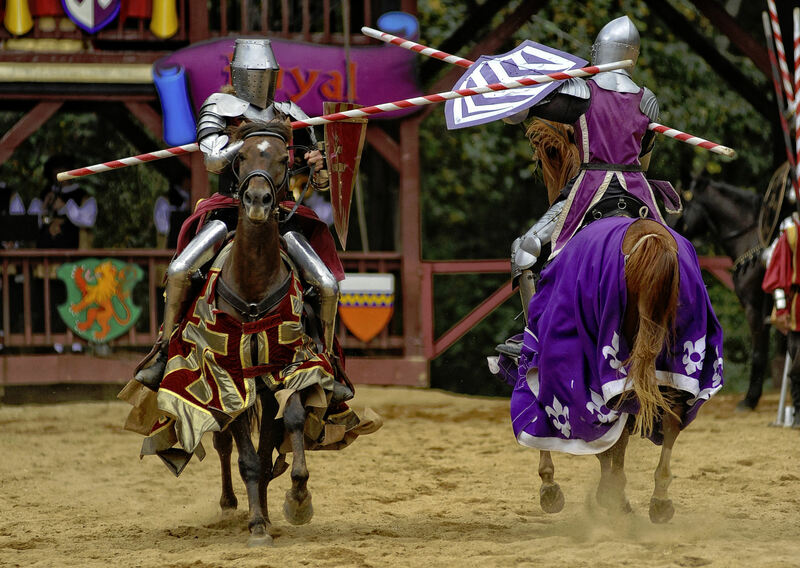 Jousting was a martial game that originated in the Middle Ages. It was played between two horsemen wielding lances. The two opponents rode towards each other at high speed, with the goal of breaking each others shields and in some cases, de-horsing each other. Medieval jousting was a fierce and bloody sport. It was banned in France in 1559 after King Henry II died of wounds inflicted in a tournament. Nonetheless, jousting remained popular in many countries. In England King Henry VIII was a big fan. Unfortunately, he had a huge jousting accident which nearly killed him. The accident occurred at a tournament at Greenwich Palace on January 24, 1536 when Henry was 44 years old. Henry, in full armor, was thrown from his horse. The horse, also in full armor, then fell on top of Henry! The King was unconscious for two hours and it was probably a miracle that he survived. The accident left him with a terrible ulcer in his leg that distressed him for the rest of his life. Some historians think it was this incident that contributed to Henry’s tyrannical ways and all the beheadings he ordered in his later life. Needless to say, the King’s jousting days were over after that, but the sport remained popular throughout the Renaissance period. The modern day Ren Faire has a much tamer version of the joust. However, they still use real horses and real shields, and it is very exciting! Here, the Order of the Sun vs. the Order of the Moon. The tournament is presided over by Lady Cordelia. What would a country faire be without livestock? If you are thinking of bringing your children, please do! Bristol has a petting zoo, complete with sheep, goats, llamas and Shetland ponies. They even have rides! However, you won’t find any roller coasters or Ferris wheels. All Ren Faire rides are powered by wind alone, along with some human elbow grease. My nephew decided to give the bungee challenge a try, with the help of a friendly pirate. AARRGGHH! Falling backwards over the trees! Several more flips are involved. And back on land with our friendly pirate. Speaking of pirates, seafaring women are greatly underestimated! This gal was modeled after Grace O’Malley, a real-life female swashbuckler who led many raids along the coast of Ireland. Before closing time at the Faire, all gather for the big dance. Marauders, invaders, Vikings, Saxons, Goths and pillagers of all stripes are welcome! Finally, our revels are ended and the ladies of the court bid us good-bye.